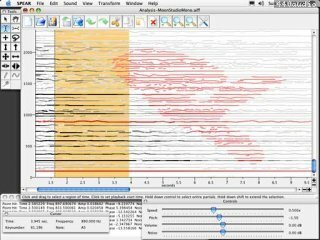 SPEAR (Sinusoidal Partial Editing Analysis and Resynthesis) is an application that implements sinusoidal analysis (MQ/PARSHL method) and a full-featured GUI. 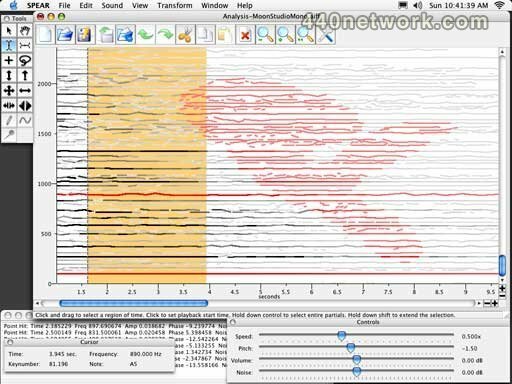 It supports flexible selection and immediate manipulation of analysis data, cut and paste, and unlimited undo/redo. Hundreds of simultaneous partials can be synthesized in real-time and documents may contain thousands of individual partials dispersed in time. It also supports a variety of standard file formats for the import and export of analysis data. This version fixes a bug with SNDAN files. * Support for Unicode filenames/pathnames. This fixes the long standing problem with pathnames containing non-ASCII characters. * Reorganized and streamlined synthesis options in the Sound menu. Choose various options under the "Synthesis Method" submenu. * Preferences for controlling noise resynthesis. The noise bandwidth and filter order can be adjusted. High filter orders will produce a noise band with a steeper amplitude cutoff slope. * Adjustments to the scaling effect of the noise slider. The pencil tool now works! Amplitude is proportional to horizontal velocity: the faster you move to the left or right the higher the amplitude. Many small bug fixes and interface improvements for Windows. Support for DirectSound and ASIO sound devices on Windows (select in the Preferences window). Improved Windows and Mac installation. Wow! amazing potential here... From just playing around with it, this looks amazing - ability to control every partial down to the minutest detail. crazy. Resynthesis has not sounded very full for the audio i tried, but it was very polyphonic and i have not yet fooled around with the FFT resolution, which i think would help this.